ZyXEL, a leading supplier of networking and communications solutions, will be supporting Panasonic System Communications Company Europe (PSCEU) a world leading manufacturer of video equipment, security solutions, camera systems and recorders at IFSEC International 2012 the world’s largest annual security event. ZyXEL’s will display a number of its high-performance PoE switches on PSCEU’s stand at the event, and demonstrate their effectiveness when deployed as communications infrastructure platforms for PSCEU’s i-Pro SmartHD surveillance systems. ZyXEL will be showing its newly-released eight-port GS2200-8HP Gigabit Ethernet Power-over-Ethernet (PoE) switch for the first time in public on the Panasonic stand. This solution is ideal for IP surveillance deployments where there are a small number of channels or surveillance cameras required in a specific location, providing a more convenient, easier to manage and affordable solution for both small businesses and larger deployments. Support for high-powered PoE IEEE 802.3AT as well as IEEE 802.3af makes the switch perfectly-suited for network devices that consume more power, such as IP cameras that have pan, tilt and zoom functions and built-in heating to ensure they continue to function in low temperatures. Other models from the GS2200 range of Layer-2 managed switches, including the 24- port PoE model, will also be on display. This entire range now comes with advanced software support for IPv6 and intelligent PoE so that the switches can either provide power to the IEEE standard or detect the real consumption of the device. ZyXEL GS2200 PoE switches form part of a solution that monitors the power required from the IP Camera and sends alerts if a variation is detected providing customers with added investment protection and advanced warning of potential camera issues. ZyXEL will also demonstrate the ES2024PWR, a 24-port PoE, stackable, Layer-2 managed switch that is already a popular choice for Panasonic partners deploying the company’s IP-based surveillance systems. PSCEU plans to launch a new web-based configuration tool, which partners will be able to use to accurately assess the IP surveillance and networking requirements for customers. This new resource will make it easier to show customers the different options available to them, both in terms of the types of cameras that can be deployed and the networking equipment required to support them. The configuration tool will incorporate a range of ZyXEL switches identified as being ideal as networking infrastructure to support Panasonic products. 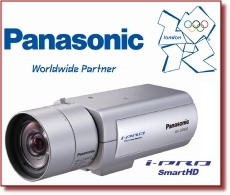 Panasonic System Communications Company Europe, a division of Panasonic, is a leader in the provision of security, telecommunication and imaging products. With a long established dealer network, Panasonic is proud of the comprehensive range of quality products, customer service, project management and technical support provided to its customers.